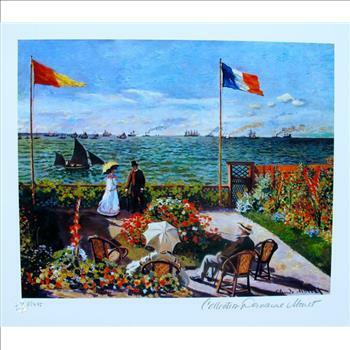 This is a CLAUDE MONET (ESTATE COLLECTION DOMAINE) giclee titled "TERRACE BY THE SEASIDE". This piece is pencil signed on the lower right as 'Collection Domaine Monet' and has an embossed seal stamped by the Estate Domaine. Paper measures 11.5" x 13". Image measures 9" x 11". Published on thick quality archival paper. 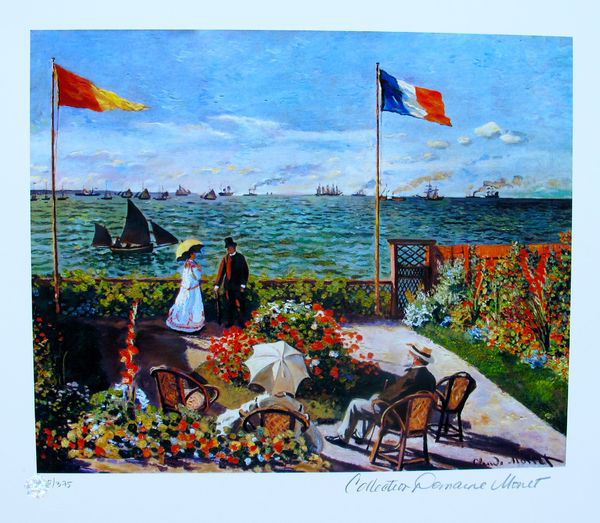 In excellent condition,Comes with a certificate from the Monet Domaine Collection! Claude Oscar Monet was a French impressionist painter who brought the study of the transient effects of natural light to its most refined expression.